PARIS A French intelligence report on Monday alleged that the Syrian regime launched an attack on Aug. 21 that involved a "massive use of chemical agents" and could carry out similar strikes in the future. The government, on its Web site, published a 9-page intelligence synopsis about Syria's chemical weapons program that found that at least 281 deaths could be attributed to the attack in rebel-held areas outside Damascus. The analysis based that count in part on dozens of videos culled by French intelligence services. The extract said "the analysis of intelligence that we possess today leads us to estimate that on Aug. 21, 2013, the Syrian regime launched an attack on some areas of the Damascus suburbs held by opposition units, bringing together conventional means and the massive use of chemical agents." President Francois Hollande has backed a call from President Barack Obama for a military strike against Syrian President Bashar Assad's government in retaliation for the chemical attack. Prime Minister Jean-Marc Ayrault hosted lawmakers, his defense and foreign ministers and intelligence and security officials Monday to discuss Syria. France is "determined to take action against the use of chemical weapons by the regime of Bashar Assad, and to dissuade it from doing so again," Ayrault said after the meeting. "This act cannot go without a response." Ayrault added that France would not act alone and that Hollande was "continuing his work of persuasion to bring together a coalition as soon as possible." The intelligence estimate also said it didn't appear to be the first time that chemical weapons were used in Syria this year. It said French intelligence services had collected urine, blood, soil and munitions samples from two attacks in April - in Saraqeb and Jobar - that confirmed the use of sarin gas. "These past events and the simultaneous and massive use of chemical agents in the night of Aug. 21, 2013 in the Damascus suburbs confirm that the Syrian regime deliberately crossed a line," it said. "Our services have information ... leading us to believe that other actions of this nature could be carried out again." 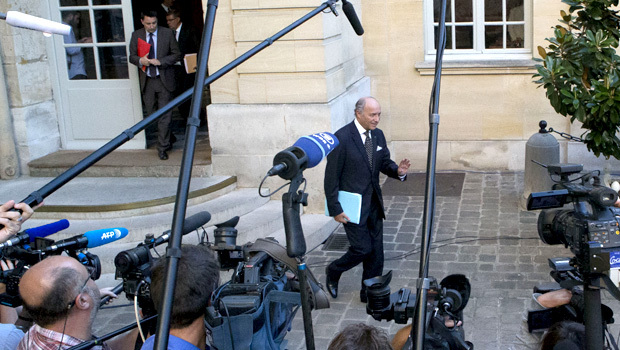 France's parliament is to debate Syria on Wednesday but no vote is scheduled. The French constitution doesn't require such a vote for Hollande to be able to authorize military action.